My mum has a few hummels and ladros and my sister has one or two ladros - I'll try to take some pics and post here. I'd love to see some pics of her Hummels and Lladros, Kelda!! Please take some pictures of them and post them here. David, interesting thread! One of my sisters started collecting Hummels years ago, but she didn't get too far. I don't believe she has more than a dozen. (She got married and had twins, and then Real Life interfered.) When my nephews were very little, the Hummels ended up in a curio cabinet at my parents' house for safekeeping, but that was years ago. I assume they're back at my sister's house, but unfortunately she doesn't have them on display. I'm going to ask her about them. Thanks for posting the pictures of the Hummels in your collection. The bank one is cool. I like the ones with the signs, too. I can see why you bought those. Good luck in expanding your collection, if that's what you decide to do. Yes, please ask her about them and then tell us what she said! She really should have them out on display because they are so beautiful! If she has them packed up, maybe she will let you have them and then you could display them at your house! Do you think that could happen? I'm surprised it happened, although I can understand WHY it happened. The economy is so bad right now, few people have the extra money for luxury items such as Hummels. I've been reading some reports about it on the Internet. They said the factory has many Hummels at the factory, and there will be plenty to go around for quite some time. So, I guess that is good news... sort of. I know they discontinued the Hummels during World War II. But they started up again after the war ended. Maybe after the economy gets better, they will begin producing them once again. They are popular all over the world and they've been manufacturing them since the early 1900s. Pennington, NJ — Ceramic manufacturer Goebel Germany will discontinue production of its well-known M.I. Hummel figurines and focus its resources on the company's home accessory brands. Other Goebel lines include Goebel Gifts, Artis Orbis, and Rosina Wachtmeister Cats. focus its resources on the company's home accessory brands. Germany as they embark on the recently announced production restructuring. stronger," said Goebel of North America President Philip Ferrigno. Nice stories, David. I hope you didn't have to sell any of the family ones. Too sad. My mom has a collection of Hummels: a cabinet full of the typical children, a few religious ones (Madonnas and the like), and a complete nativity scene, even with manger. Some of them have little paper labels with their titles. My favorite was two little children, a boy and a girl, under the protection of a guardian angel. It's pretty big. The Hummel up at the top is called "Heavenly Protection" and it is one of my favorites. My friend Betty owned that one. It is very beautiful, isn't it? That second one is the Nativity Scene I was talking about, although I've also seen it with a few more pieces - the little drummer boy, a boy playing a recorder or clarinet type instrument (called "Little Tooter" in the Hummel line) and several others. Krieg Brothers Catholic Supply Co here in Indy had that Nativity Scene for sale years ago and it was on sale too - 30 percent off. I thought about it and thought about it and eventually I talked myself out of buying it. Now I'm very sorry I made that decision. I should have bought it! Do you collect any figurines? Or anything interesting? If so, please include them in this thread! I have never heard of Hummels. Reading this thread has been quite a learning experience for me. They are certainly very cute. I can see why you're so keen on collecting them, David. I collect figurines of gods. I have about 50 figurines. They are primarily Egyptian, with some Hindu, Buddhist and Greek also. Some of them are classy and some quite trashy. The largest is a splendid statue of the falcon-headed Egyptian sun god, Ra. He's about 60cm (2ft) tall and stands in the middle of my dining table, from whence he holds court. He is a very majestic presence in my home. The smallest figurine is a tiny, beautifully detailed figurine of the elephant-headed Hindu god, Ganesh. Traditionally, Ganesh should be located inside one's front door, facing the door, to guard your home. And that's where my Ganesh is located (I have more than one Ganesh). 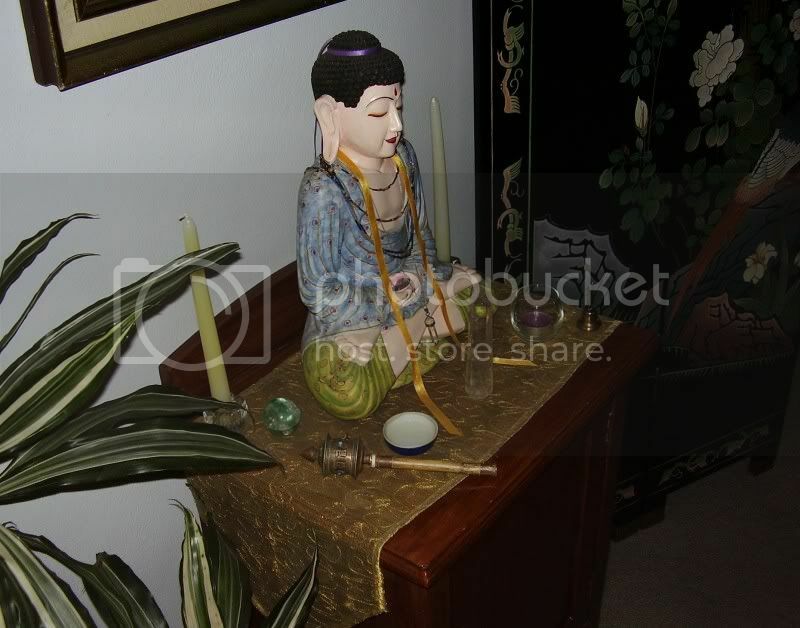 Hand carved, hand painted, wooden, Balinese Buddha, given to me by George on my 50th birthday. 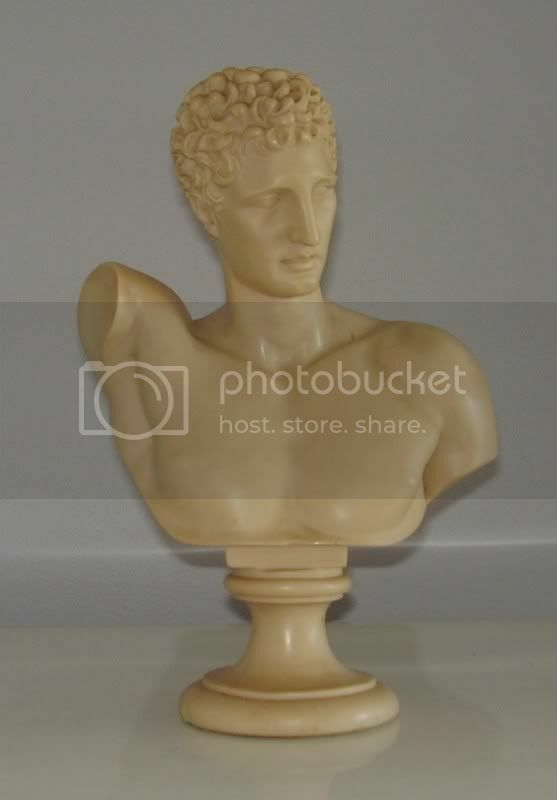 Bust of the Greek god, Hermes. This is not mine. This is an Internet pic of the full-length original by the Greek sculptor, Praxiteles. Mine is a reproduction of the head and shoulders only. It was given to me by George in 1974. I'll take some pics of my gods and post them here. Would you consider changing the title of the thread to something like "Collectables," David? I used to see my friend sell Hummels in his gift store! Some are highly collectible and so rare! 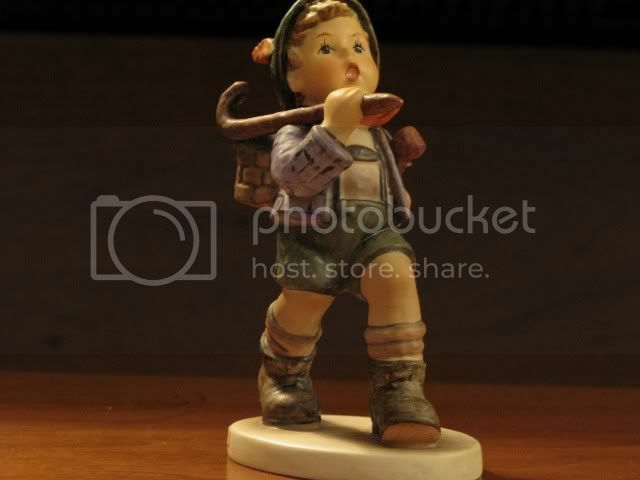 This Hummel is called "Runaway" and he is about 6 inches tall. He's a cute little guy, isn't he? My parents gave him to me one Christmas. I had my eye on him for a long time and somehow my Mom knew to buy him for me. I never talked about him to her nor Dad, so I really don't know how she figured it out. But there he was one Christmas, all wrapped up in a box and a bow! This is the other side of the figurine. He carries a mandolin type instrument under his arm. I've always wondered what he's running away from? I'd like to think he's off on an innocent adventure and will be back in time for his supper. 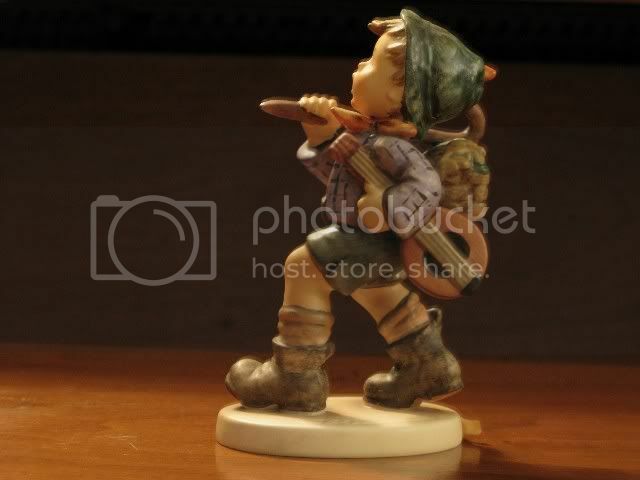 I've just been through this thread again, trying to decide which Hummel is my favourite (not easy to decide), and I think it might be this little chap, the Runaway. Having said that, however, I also love the guardian angel with the two small children, and I love the nutcracker too - he looks so mischievous. The Runaway is so joyous. I have no doubt he'll be home for his supper, David. I remember setting out on just such adventures when I was about his age, complete with sandwiches and lemonade, with my dog in tow. We had so many wonderfully exciting adventures without once leaving the back garden. Hermes was the great Olympian God of animal husbandry, roads, travel, hospitality, heralds, diplomacy, trade, thievery, language, writing, persuasion, cunning wiles, athletic contests, gymnasiums, astronomy, and astrology. He was also the personal agent and herald of Zeus, the king of the gods. Hermes was usually depicted as a handsome and athletic, beardless youth, and sometimes as an older bearded man. His attributes included the herald's wand or kerykeion (Latin caduceus), winged boots and sometimes a winged travellers cap and chlamys cloak. I tend to favor the jewel tones in the stemware - ruby, cobalt, amethyst, and emerald. I started this circa 1992, mostly stopped the collecting by 2002, but now I tote around a small brown scallop-like seashell and cobalt blue marble in my pocket most of the time. We used to actually use the stuff on a regular basis. Maybe having a dinner party could be a goal for 2009. Makes a $6 Chardonnay taste like liquid gold, in my opinion. Which reminds me, I've been choosing Australian wines lately. I'll have to keep some of the labels, get your opinion!